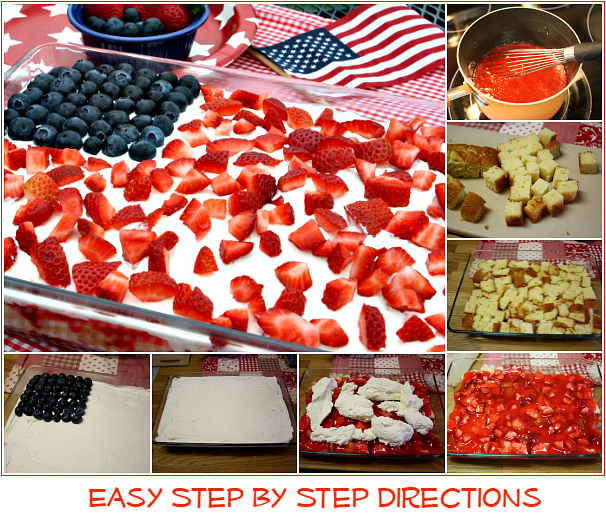 A quick and easy no bake patriotic cake celebrating the red, white and blue! Everyone will love this simple festive dessert. Happy Thursday everyone! 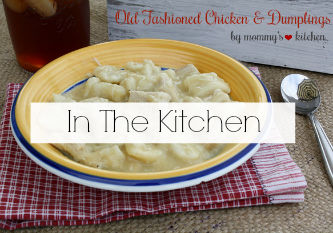 Today I have a no fuss recipe to share with you. 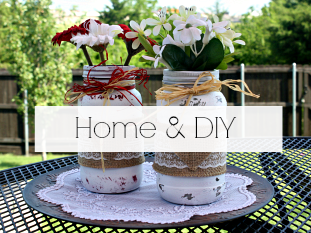 Are you having a Memorial Day cookout with family and friends? 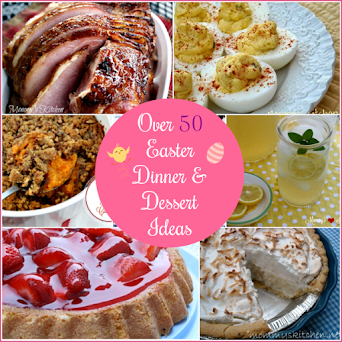 If so I have the perfect dessert! 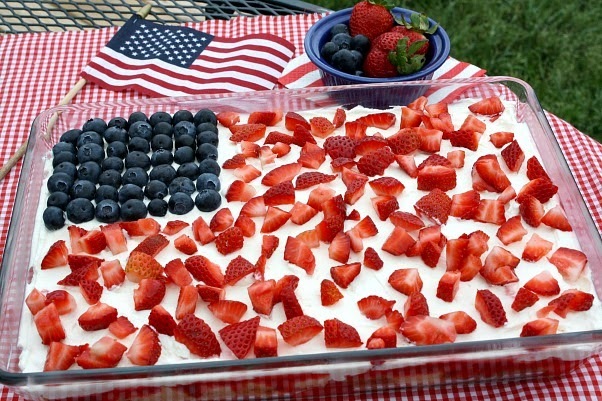 How about this festive No Bake Patriotic Cake! The best part is this light and fluffy cake is made without turning on the oven! This recipe starts with store bought pound cake, strawberry glaze, and a creamy whipped cream and cream cheese topping. 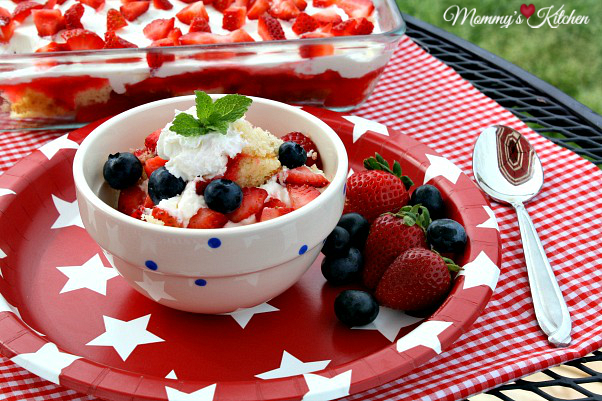 Fresh blueberries and chopped strawberries are added to create festive stars and stripes. Memorial Day is a day of remembering the men and woman who died serving in our country's armed forces. It's a day to pay respect to all who have lost their lives making the ultimate sacrifice. Sometimes all of us can get caught up in cookouts and barbecues and forget the true meaning of Memorial Day. I grew up in a military family and several of my family members are still dedicating their lives to our armed forces. Cookouts and holiday celebrations give us all a chance to spend quality time with family and friends, but please take time from your Memorial Day festivities to pay respect and pray for those who died while serving in our countries U.S Military. For their families it is more than a barbecue or cookout. 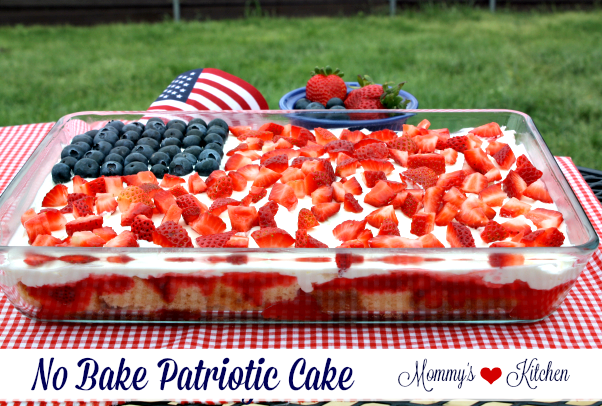 If you do have a get together this Memorial Day weekend remember every great cookout should end on a sweet note, so I hope you'll give this No Bake Patriotic Cake a try. I love super simple desserts that require no baking especially when it's hot outside. This easy red, white, and blue desserts comes together in no time with just a handful of ingredients found at your local Walmart. For the cake base I used pound cake from the bakery department. This was the first time I have the pound cake at Walmart and it was really good. I usually purchase Sara Lee's pound cake, but this was really moist and priced at only $2.98 each. I have included some easy step-by-step photos of how easy this cake came together. If using homemade strawberry glaze, prepare the glaze first so it has sufficient time to cool. If using store bought glaze omit this step (I used homemade glaze). 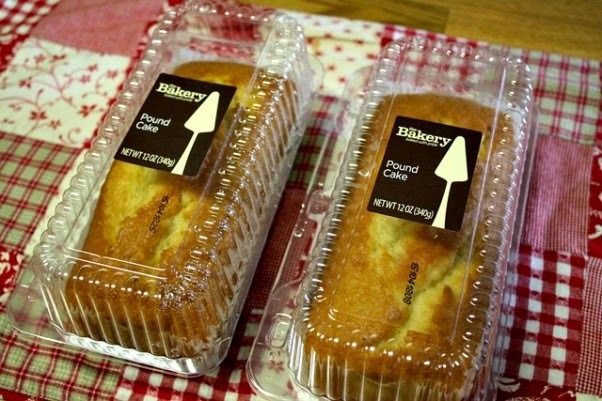 Cut the pound cake into one inch cubes and arrange in a 13 x 9 inch baking pan. Add the strawberry glaze over the pound cake and spread evenly. Sprinkle about 1 1/2 cups chopped strawberries over the glaze. Prepare the whipped cream topping, by whipping the cream slowly until the cream is lightly thickened and soft peaks start to form. Add the softened cream cheese to a separate bowl and whip until creamy. Add the cream cheese, vanilla, and powdered sugar to the heavy whipping cream, and continue whipping until the cream forms semi stiff peaks. Drop the whipped cream mixture by dollops over the strawberry glaze and spread evenly to cover the glaze completely. Add the fresh blueberries and remaining chopped strawberries. Refrigerate cake for at least 2 hours before serving. Refrigerate any leftovers. Cook's Note: Store bought strawberry glaze is not always in stock at my grocery store, so I have included a homemade version if you're unable to find it. Raspberries can also be substituted for strawberries. 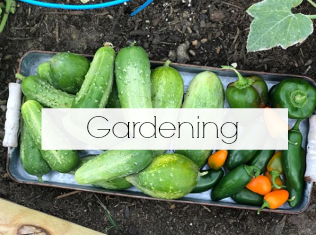 In a medium saucepan, combine sugar, water, and cornstarch. Cook over medium high heat until it boils and thickens. You will know the mixture is thick enough when it coats the back of a spoon. Remove glaze from heat, add gelatin, and mix to combine using a wire whisk. Cool glaze before using. 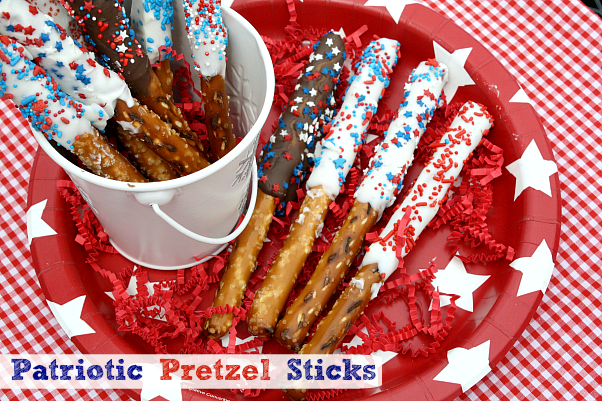 I also made up a batch of these fun Patriotic Pretzel Sticks! These chocolate dipped pretzel rods are super simple to make and and are perfect for your Memorial Day table. Everyone will love the sweet and salty combination of these yummy pretzel treats. I made two varieties, white chocolate, milk chocolate with caramel. In a small bowl add the caramel bits and the water. Using the defrost setting melt the caramel until smooth and runny. Place one end of a pretzel rod into the caramel, and spoon the melted caramel over at least 3/4 of the length of the pretzel rod. lightly tap the pretzel on the side of the bowl to remove excess caramel. Lay the pretzel rods on parchment paper to set the caramel. In a small bowl melt the chocolate bark on the defrost setting of your microwave until smooth (about 6 minutes) I melt the chocolate in 3 minute intervals, remove, stir, and melt the last 3 minutes. Dip each caramel covered pretzel rod into the melted chocolate and spoon the chocolate over the caramel. Lightly tap the pretzel on the side of the bowl to remove excess chocolate. Add sprinkles and place pretzels on parchment paper until set. In a small bowl melt the vanilla bark on the defrost setting of your microwave until smooth (about 6 minutes) I melt the chocolate in 3 minute intervals, remove, stir, and melt the last 3 minutes. Dip each pretzel rod into the melted vanilla bark and spoon the melted vanilla over 3/4 of the length of each pretzel. Lightly tap the pretzel on the side of the bowl to remove any excess vanilla bark. Add sprinkles and place on pretzels on parchment paper until set. If you're looking for more Patriotic recipe ideas check out my Walmart posts for these easy Red, White & Blue Mini Fruit Pizzas and this Red, White & Blueberry Angel Fluff. Could you use raspberries instead of strawberries? 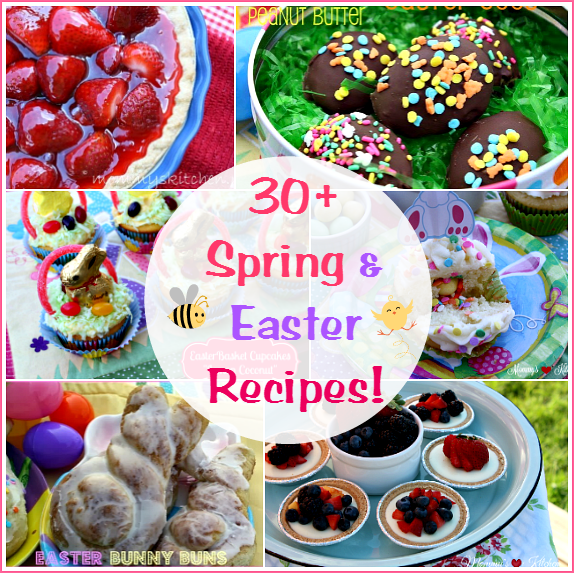 Could you make the homemade glaze by substituting raspberry jello? I'm allergic to strawberries. Yes you could. That would be a wonderful substitute. Would this still be good/look good if made the day before and in the fridge for 24 hours? I was wondering the same thing. I'm allergic also! Nice to see I'm not the only one!!! I usually make mine the morning of the day that I want to serve it. OMG. I made this cake yesterday. Pretty easy. We went to a bar b que. It was a big hit. We have family coming in to visit in june. Thanks Robin! I made it again yesterday for Memorial Day and shared it with our neighbors. I just have a smidge left, so I think I will hide it for myself. is the jello already made or is it powder to mix into glaze? For the strawberry glaze you can purchase store bought or make a homemade glaze. The recipe is at the end of the post under Homemade Strawberry Glaze. The Strawberry Jell-O is only used if you make your own glaze. If using store bought it is omitted in the recipe. 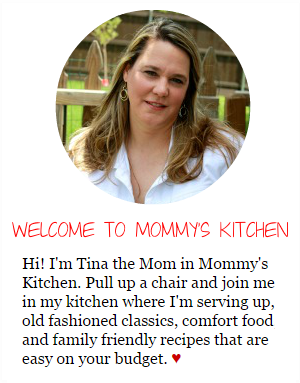 Oh Tina - your gorgeous photos always grab me by the neck and pull me into the computer. ;-} This looks and sounds SOO good! 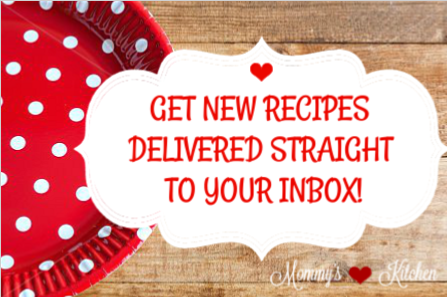 Love no bake anything, but especially holiday dishes. Thanks for sharing all your beautiful deliciousness with us at Weekend Potluck. <3 this!!!!!!!!!!!!!! Hi this is super good!! I actually used Twinkies instead.